This beautiful rainbow bracelet is a delicate bracelet made with Sterling silver heart link chain and a row of colourful Swarovski crystals across the centre. Perfect for remembering someone special with free engraving on the discreet silver heart charm. This memorial bracelet makes a thoughtful sympathy gift to give in support of someone who is grieving or a special piece of remembrance jewellery for yourself. Our Memorial Bracelets ideal sympathy gifts if you're looking for something unique and personalised to show love and offer comfort to someone who is mourning the loss of a loved one. Metal Parts: All parts including the engraved heart are 925 Sterling silver. Engraving is included in the price. This bracelet is good for engraving special names, dates, initials or other meaningful words. Up to 12 characters per side can be engraved on the tiny heart which measures 10mm x 9mm. 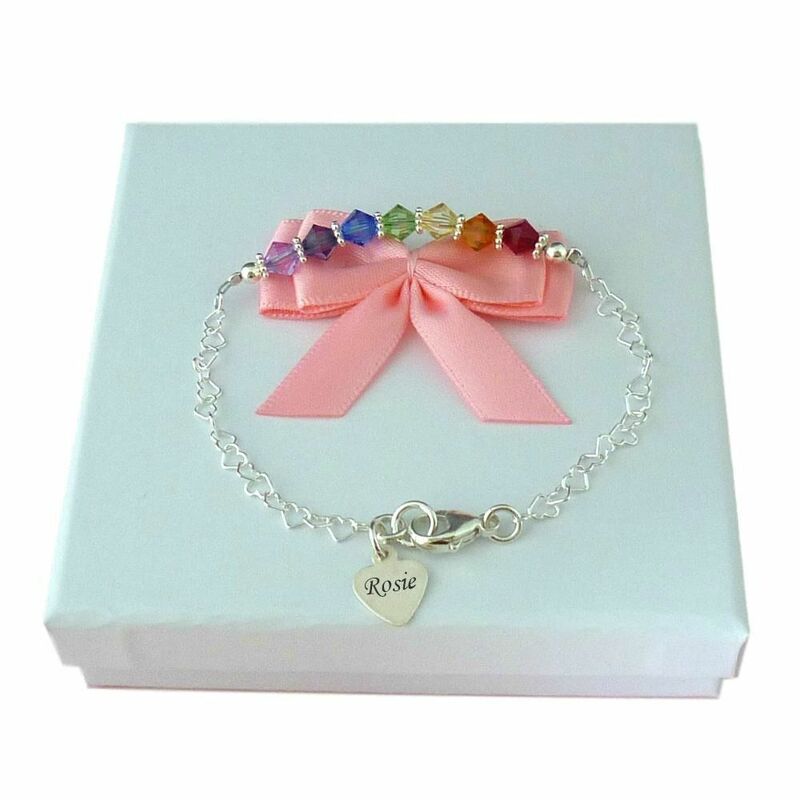 Each rainbow bracelet is lovingly presented in the gift box shown with the pink bow on top (other colours on request), along with the free "Thinking of you" gift card included in case you wish to hand write a personal message inside. Delivery: All orders are packed and dispatched within 3 days following receipt of payment. For post and packing costs please see our shipping menu. Standard or Express Delivery is available.